Where education and fun combine! Are you ready for another monster drawing lesson? Well, here he is... BUBBLES! Bubbles is a very entertaining monster. He loves to chew bubble gum and blow bubbles. He blows bubbles all morning, afternoon, and night. Bubbles also collects yo-yos. Bubbles is an incredible monster! Thanks go to Ambria B. from California for this cute, and multi-talented monster! Step 1: Draw Bubbles' head. He has a round head with a flat bottom, three yes and a bubble coming out of his mouth. His hair can be drawn using little squiggles. Step 2: Draw two straight lines going down and then connect them with a curve at the bottom. This is the middle of his body, so make it as tall as you want him to be. Step 3: Create a wiggly line for each side of his body. Add in little lines to show that it is wiggly. Step 4: Add four straight lines for the tops of Bubbles' legs. Step 5: Now to add his feet. Make a straight line for the bottom of his feet, then add a curve to the top. His feet are not very large, but you can make yours bigger if you want. Step 6: Bubbles has a skateboard! This can be drawn by making an oval under his feet. Then add another layer of the oval to make it look like a thin board. Step 7: Add two wheels onto the board by drawing two circles for each wheel. Step 8: Bubbles has four arms. So draw some lines coming from his body that will be the beginning of his arms. Step 9: To draw Bubbles' hand, start with a curve coming up from the bottom line of one of his arms. Then, draw his finger sticking out from there and a line to connect that to the top line of his arm. Step 10: Repeat step 9 for each of his arms, so now he has 4 hands! Step 11: Add in the yo-yos! Each yo-yo is a circle and is attached to a string that goes to his fingers. 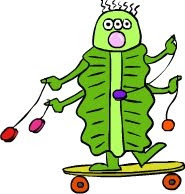 Since Bubbles is moving on his skateboard, the yo-yos are blowing in the breeze a bit. Have fun drawing your own versions of Bubbles! What if he liked roller skates instead of skateboarding? What if he liked to play with bouncy balls instead of yo-yos? What would he look like then? he reminds me of a piece of lettuce. yum yum!! I think that if he had roller skates, he would be changed, not really drastically, but in a small way. You wouldn't be able to see his little green feet anymore, and it would be like he was wearing sneakers with wheels. It would be different, at least. And if he played with bouncy balls, you would have to make more decisions, like whether all the balls would be in the air, or all in his hands, or all of them in different places. That would be a bigger change than wearing roller skates, I should think. But he would still be cute!